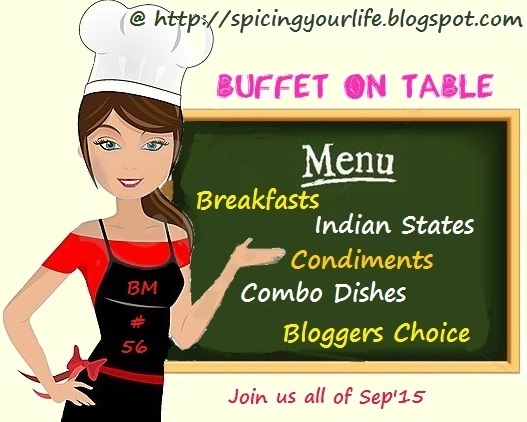 We are starting the BM#56, Buffet on Table, Week 3 today, which will feature condiments across countries. When you want to know what a condiment is, I simply referred all to wiki. A condiment is anything that’s added to food to impart a particular flavour or to even enhance its flavour. It can be a spice, a sauce or even a prepared food. In some cultures, it can even be served to complement a dish. Though this term originally described pickled or preserved foods, its now widely used. Even salt and sugar are condiments. After the heavy duty Indian States, I had no energy to prepare elaborate condiments and resorted to simple ones. Rather some of these were made few months back, having in mind that I will end up cooking a lot for the Indian states. Anyway coming back to the theme, going by the definition of the term condiment, I have tried to prepare it in the different forms it can mean. Today’s condiment is a fresh sauce from Italy. Pesto, a sauce from Italy, was originally was prepared with Basil, garlic, pine nuts and blended with olive oil, Parmesan cheese. Traditionally the pesto is ground in a mortar with a pestle. 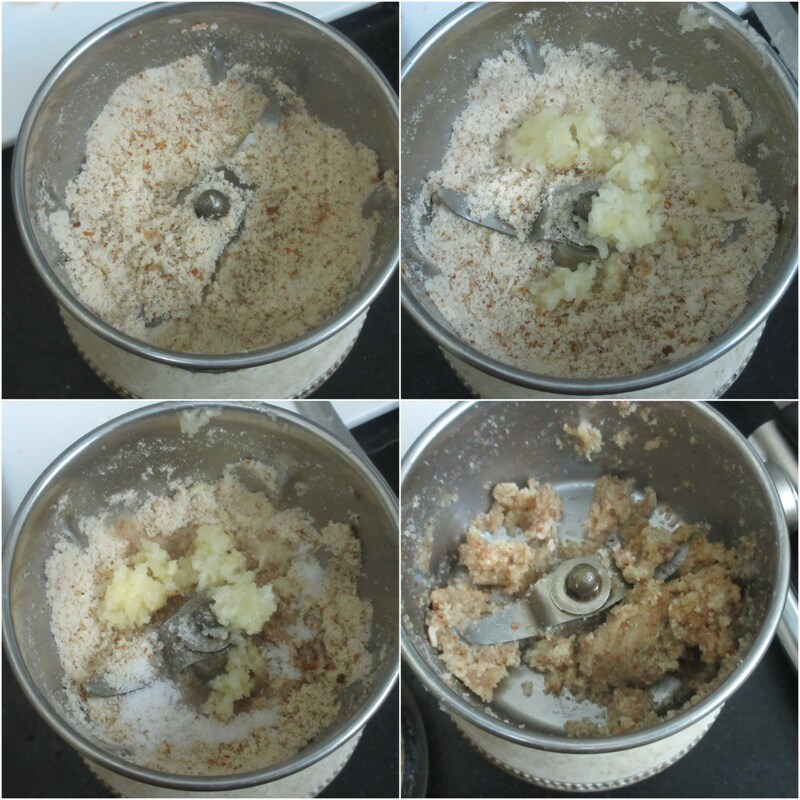 Even though I have a mortar and pestle, I used by mixer for quick sauce. It can be preserved or refrigerated up to week, and can be frozen over a month. Just with any green leaves, after grinding, the leaves tend to get oxidized. 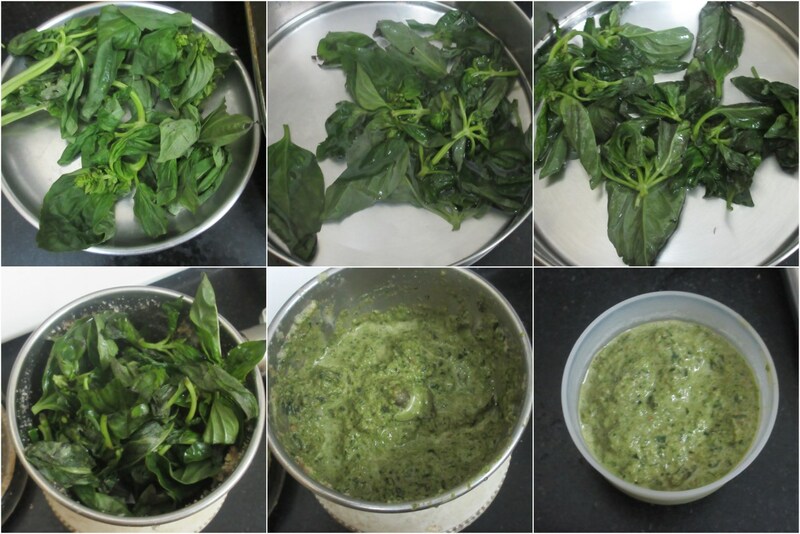 To avoid that you can blanch the basil leaves, drain and then make the sauce. Blanch the Basil leaves and keep it aside. Add salt and pepper as required, add Basil leaves and grind to an almost smooth paste. Add Parmesan cheese at the end. Use in any pasta dish as desired. 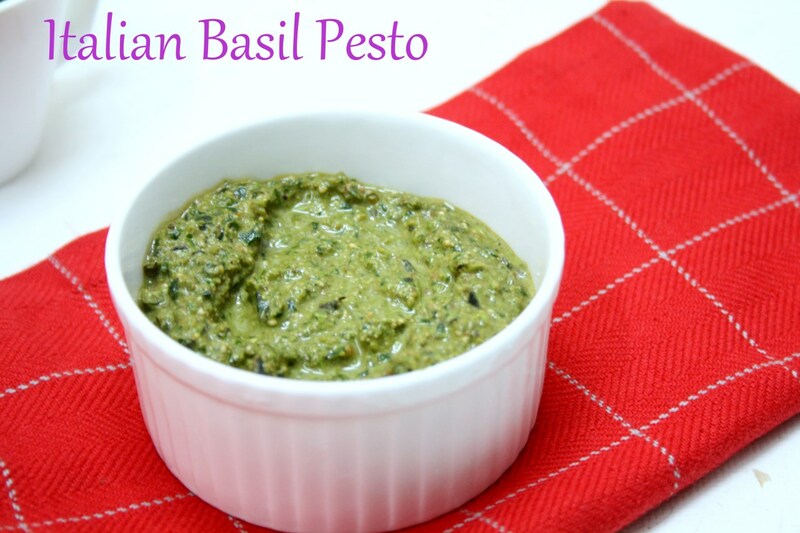 I used this pesto to make Spaghetti in Pesto Sauce. I have only tried basil with pine nuts and walnuts but never with almonds.This pesto looks so fresh and delicious.Very nice start up. Pesto also tastes great with stuffed chilies. One of my cousins uses store bought pesto to make stuffed mirchi curry. Even i have tried a couple of versions of pestos but the one with pinenuts and basil is the most amazing . The almond pesto looks fresh and tempting . 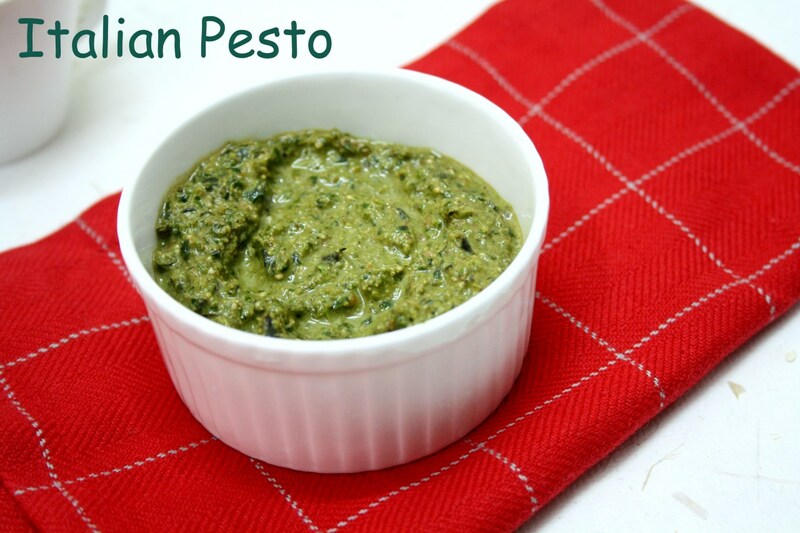 My kids like the pesto a lot but never got around making it..should try soon. My daughter too loves pesto .. yummy. Yummy..Like pesto a lot .Yet to try on my own.. Whenever i ran out of pinenuts i'll go immediately for almonds, fabulous pesto. Adding almonds instead of pine nuts is great. Lovely dip and a famous one too!!! Though we get pine nuts here, it costs a bomb, so i always use only walnuts. Love that vibrant green it gets after blending!!! We love our pesto on toasts, yumm!!! That is a classic condiment to start the week with. 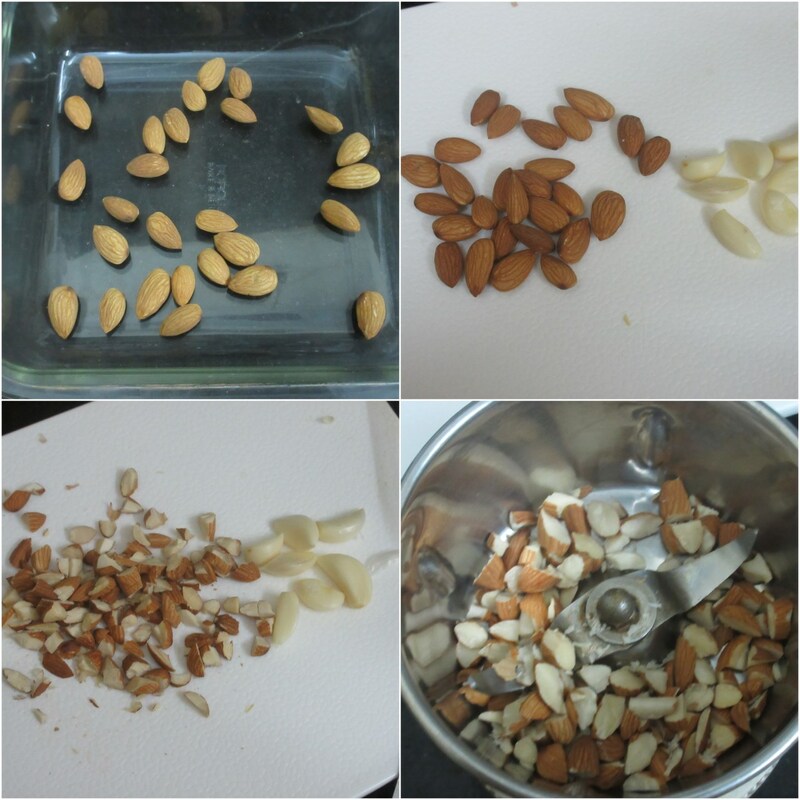 I have never made pesto with almonds, will have to try your version some time. That is one loaded with flavor. 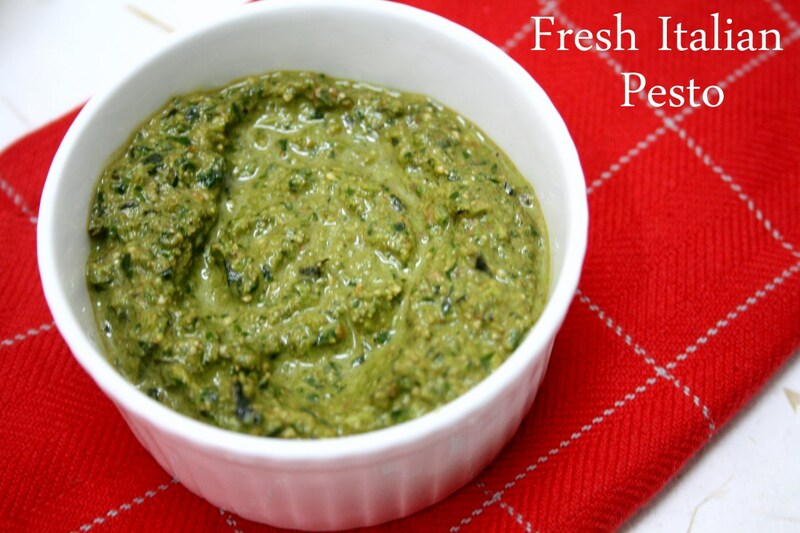 Such an aromatic and delicious pesto with basil , I make them with pistachios some time it gives more green colour to the pesto , almonds is an lovely idea too !! What a beautiful color! I have been putting his off because of the pine nuts. Maybe I should start off with almonds instead!